EXECUTIVE SUMMARY: Anti-Semitism is growing increasingly normalized in American society, particularly in progressive circles. Today’s progressive Left, led by Bernie Sanders and others like him, is even further removed from the facts than the Democratic Party was under Clinton. One of the most pernicious effects of this normalization relates to the discourse on Israel. Twenty-five years after the Oslo peace accords, the progressive Left, which now loudly dominates the Democratic Party, is walking around “with dead eyes, following orders” when it comes to the Middle East and the Israeli-Palestinian conflict. Upstart Democratic congressional candidate Alexandria Ocasio-Cortez decried the “occupation of Palestine” during a television interview but was at a loss when pressed to explain what she actually meant. 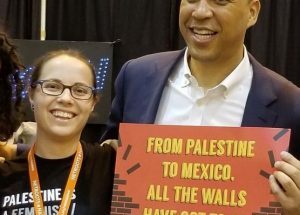 Even a moderate Democrat like Cory Booker, previously close to the Jewish community, saw fit to pose with BDS representatives as a means of flaunting his progressive credentials. In general, the progressive view sees Jews not only as “white” but as racists and victimizers because of their presumed power. All this exemplifies the slow erosion of Israel’s status in American culture. But the disconnect runs even deeper. Like Cortez, the children of the Oslo era don’t remember the negotiations in the 1990s, or then-PLO Chairman Yasser Arafat for that matter, and have grown up on slogans with buzzwords like “occupation” and “intifada.” On the other hand, this generation, both in the Middle East and outside it, is extremely active online. In fact, 63% of Palestinian kids have access to the internet on a computer and 51% report they own a smartphone. The internet is already playing a significant role in their lives and what they are seeing is the Palestinian “resistance” against Israel, not Palestinian society suffering under Hamas or Palestinian Authority oppression. The most ostentatious confrontations take place on Twitter and Facebook, where Palestinians sow allegations of destroyed villages and war crimes, going as far as claiming that Tel Aviv was founded on the ruins of invented villages. Instant gratification, yes. Honesty, not so much. The same trends are evident in higher education, where there has been a notable increase in online classes. In such a setting, there is less opportunity for debate and discussion. Our growing collective dependence on technology and social media is undeniable, but these trends – and the general tone of politics – reduce complex issues into sound bites and thereby drive polarization. One of the major themes of Oslo was to generate trust through confidence-building measures. New mechanisms were put in place to ensure equal rights in employment and policing, and militia weapons were decommissioned under international supervision. The hope was to build a high level of trust through face-to-face interaction. Today’s social media-driven politics achieves the exact opposite of those confidence-building steps. We are left only with the option of parsing online discussions and debates in order to understand the general attitudes. The hard work of building trust is gone and in its place we are left with zombies blindly following slogans. When Arafat rejected the Camp David II accord back in 2000, it devastated the liberal left-wing camp. They couldn’t understand how Arafat could reject the prospect of a real Palestinian state. Today’s progressive Left, led by Bernie Sanders and others like him, is further removed from the facts than the Democratic Party was under Clinton. They don’t understand that Palestinian nationalism never saw the conflict as one between two national groups with legitimate claims and aspirations. They fail to recognize that Arafat and his successors professed support for a two-state solution as a means of appeasing the West. All of this has led to a steady normalization of anti-Semitism in American society, particularly in progressive circles. One of the most pernicious effects of this normalization relates to the discourse on Israel. A relentless misrepresentation of human rights violations, slanderous talk of Israeli “ethnic cleansing” and “genocide” and bitter attacks on Israelis, their international supporters, and the peace process itself have taken a massive toll on American civil discourse. This article was published by Israel Hayom on September 18, 2018.